I built a four port keezer line cleaner modeled after a suggestion from my good friend Pierre Margraff. 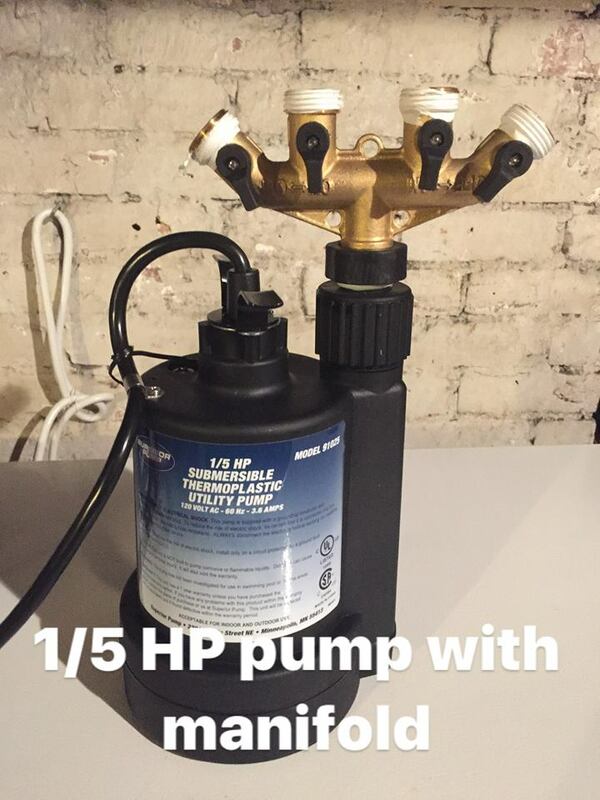 After buying a ⅕ HP sump pump, I tried to pump cleaning fluid through the four faucet lines in series to clean them all at once. It was apparent that it wasn’t going to work as I anticipated due to the accumulated resistance of 40’ of tubing plus all the small openings of the quick disconnects. By the time the liquid came out the last faucet, it was barely a trickle; I wanted a more robust flow to recirculate the cleaner. Pierre suggested running the lines in parallel instead of in series such that a manifold provided each faucet its own dedicated port and service line. This would greatly reduce the overall resistance and increase flow to each faucet. 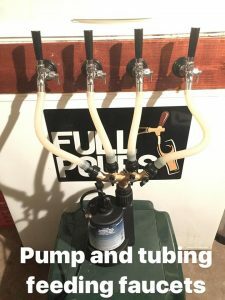 He described a cleaning manifold he created for a local brewery with great success and suggested a similar design using a PVC 4-port manifold from an online hot tub supply store and finishing it from parts found at Home Depot. I started thinking about building this manifold from parts I could find locally but couldn’t really find the proper pieces. By chance I was meandering down the gardening aisle when I spotted exactly what I needed to use to go onto the pump: a 4-port garden hose splitter, each with its own built in ball valve. This screwed on the top of the pump, all I needed to finish it up was to attach garden hose barbs to the ports. 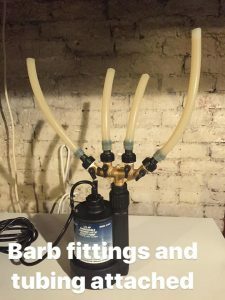 I used 4 female ⅝” garden hose mending kits and attached four pieces of ½” silicone tubing to them and onto the nozzles of my Intertap faucets. Everything fit right but would it work as I envisioned or would I be disappointed yet again? I put the pump into a bucket of water, connected all the pieces together, put the ends of all the lines (minus the QD’s) in an empty bucket, and turned it on. Amazingly it worked and worked well! Some of these parts can be found for cheaper if you look around but the pump is the cheapest I could find so definitely consider it. Hey Mike I really like this idea. I’m trying to get a better grasp on how it works. 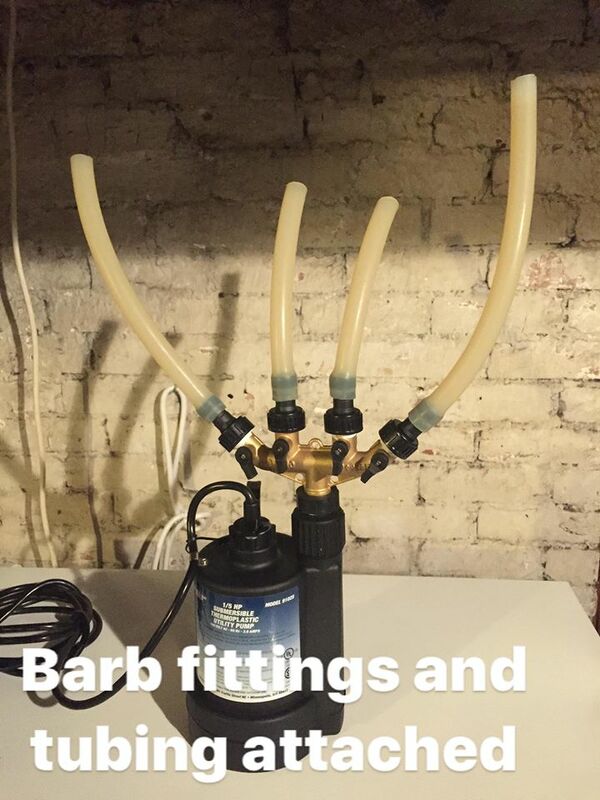 So you put the pump into a bucket of water and attach all the tubes to the taps and pump the water or cleaner in. The tap lines have the disconnects removed and the pump forces the liquid through the tap into the lines and you have them empty into a bucket. To recirculate do you open up your keezer and then put the liquid back in the bucket with the pump? The recirculation is where I think I am missing something. Hi Tim- thanks for the reply and considering my project. Basically you answered your own question. To clarify further, the first run of water is pumped from one bucket through the faucets and lines and into a second bucket which I dump as this is just to flush out all the leftover beer in them. Then I fill the first bucket with BLC and instead of running it into the 2nd bucket, I recirculate back into the first for 15 min or so. The keezer lid is open all this time as I drape all 4 lines over the top and into said buckets. I repeat this process with a rinse then follow with a starsan recirculation, another flush, and a final blowout with CO2. I hope this helps you.